This month in the Tigresses’ Canning Challenge, the secret ingredient is rhubarb (or asparagus); I made things from both ingredients before I left on the trip, and brought the pickled asparagus spears with me in the hamper on the train, and it was delish. And sadly, like the idjit I am, I did not write down the recipe before leaving. That said, I did write down the recipe for the base of this cocktail, I did can it, and it did come out so well, it will be featured at the annual barbecue here at the Hut. I highly recommend you make this cocktail (if you are so inclined and do not have abuse issues), but you do not have to can the cordial to make the cocktail; it will probably keep for a several weeks in the ice box without processing it. Rhubarb and Angelica Cordial from Laundry, Etc. Anyway, as you may recall from last month’s challenge for herbs, I paired lavender with rhubarb and it was a winner. I wanted to do something similar for this month’s challenge, but not have it be jam. Last month, there was an entry for Rhubarb and Angelica cordials from one of the British food bloggers, Laundry Etc., that really intrigued me. 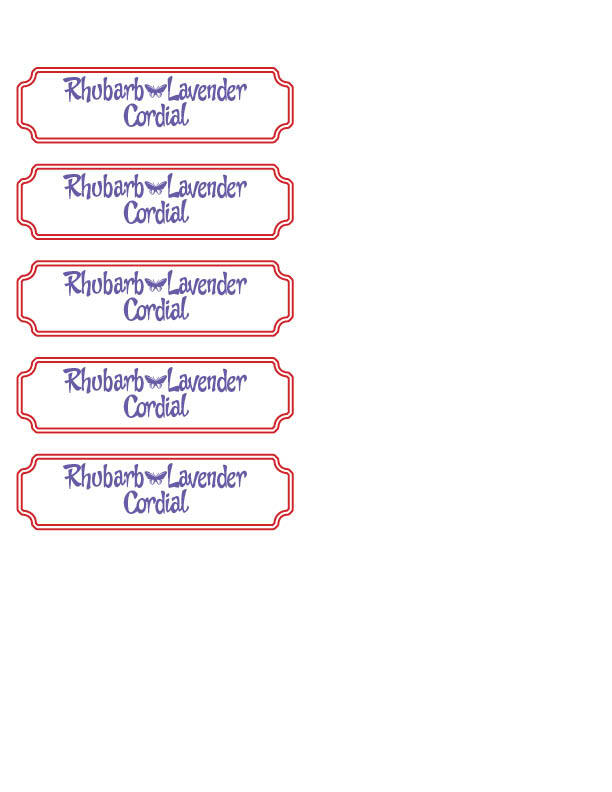 So, in short I built my entry this month upon the success of her entry last month, and the research I did on the lavender-rhubarb jam I made last month. The secret to working with lavender is to get the right amount of flower-power in your product without going too far. If you add too many lavender blossoms, you really do end up with something that tastes like very good soap — and I had my mouth washed out enough as a young ‘Grain to know. We will start by making a simple syrup with the lavender blossoms. This syrup alone is worth the price of admission, and you can use it for all sorts of wonderful things. I had a little left over and used it to glaze some pork chops, and they were amazing. Put the lavender blossoms in a tea ball, pour the water into a non-reactive pan and add the tea ball. Let it sit overnight. It will turn the most lurid color you’ve ever seen. The next day… remove the tea ball and add the sugar to the lavender water. Bring the syrup to a boil. When the sugar is completely dissolved, remove from the heat. You can take a break now or you can soldier on with the rhubarb. It is up to you! Boil the carefully prepared rhubarb in the quart of plain water for about 15 minutes. Strain the rhubarb from the water, and discard the rhubarb, saving the water. The rhubarb has done its duty and can safely go to the compost heap. 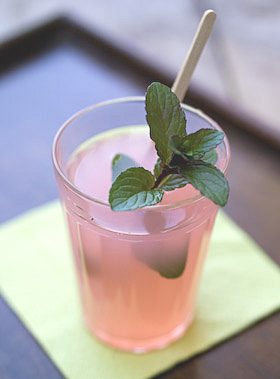 Mix some of the rhubarb water with some of the lavender syrup. 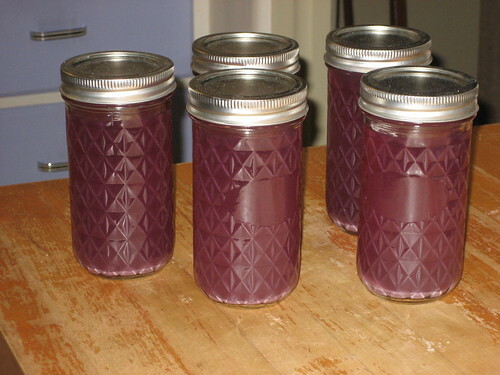 I found that about 2 parts of rhubarb to about 1 1/2 parts of lavender syrup worked out well. You may want to play with the proportions. If you are going to can the cordials, now is the time to do it. Please follow the instructions at the Tigress’s joint. I processed the mixture for 10 minutes, and it made 5 pints. OK, here’s the pay-off. This drink is so different from any other I’ve ever made, it falls into a class of its own. Fill a very tall glass with ice, preferably some crushed. Put in two parts of gin and two parts of the rhubarb cordial. Admire the color. Add a dash of bitters. I prefer orange bitters, but use whatever you have. Fill the glass with tonic water. Enjoy and admire your work. Responsibly. The butterfly cracks me up! This entry was posted in food, projects, Tengrain's Little Cooking School. Bookmark the permalink. It’s really quite an interesting color, isn’t it? Rhubarb is a scarce kinda thing around S. Texas. I can find it every once in a while at my local stores. But I have found it and made a few pies in my time, so maybe I need to get out there this weekend and scour for rhubarb. The drink has gin, so how bad can it be? Just be sure to use a really floral or herbal gin, like Bombay Saphire or the wonderful Citadel (from France, pricey but worth it), and adjust the proportions to your liking. I was stunned by the lavender color and when it gets diluted by the gin and tonic, it really becomes something pretty. If you don’t want to make the full cordial, just make the lavender syrup and add a drop of that to a G&T; it’s ambrosia. I love Rhubarb. My Granny made rhubarb pudding when I was a sprout, and I’d eat it warm from the stove with heavy cream-just enough sugar to take the edge off but the rhubarb would still make me pucker. And then, in the 1970s and 80s, there was a winery up the Clackamas river in Oregon Henry Enery’s(sp) winery made Rhubarb wine that was out of this world. Dry, with a bite. I’d drive from Washington and fill the trunk of my 1950 Ford with gallon bottles at $5.00 apiece, and feel just like Robert Mitchum driving back over those country roads. That color! Wowsa! I’m making the lavender syrup and the cordial to have both on hand for adding to my G&Ts In fact, I might dedicate the rest of Can Jam 2010 to “Things I Can Can to Add to Cocktails.” What do you think? Play with the proportions until you make it the way you like it; I prefer somewhat bitter stuff. When I was taking wine pairing class, the sommelier told me that I have a bitter tongue. Ya think? Wowzers! This looks delicious. I hadn’t thought of cannig cordials until I saw Laundry’s last month. Yum. I am definitely going to try this. Lucky for me I have a ton of organic lavender in my yard! Just remember to play with the proportions of booze to cordial to make it something you like. I made it the way I like it, but your results may differ. Or you can just add sparkling water, too.